Served with honey wheat bread & butter. 14 oz. USDA Superior Grade, Certified Angus Beef Ribeye steak blackened in Cajun spices served with your house salad and one side item. 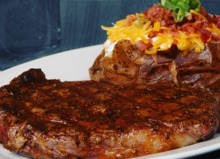 Fire-grilled USDA "center cut" 7 oz. 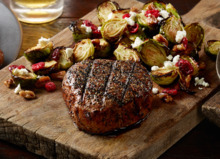 Filet Mignon served with your choice of house salad and one side item. 14 oz. USDA Superior Grade, Certified Angus Beef Ribeye steak fire-grilled served with your choice of house salad and one side item. 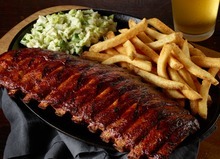 A slab of deliciously tender center cut ribs, slow smoked then grilled over a live fire. Guaranteed to be fall off the bone tender! Served with french fries and housemade BBQ baked beans. â€œPan Friedâ€ 10 oz. 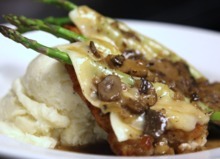 chicken breast with fresh asparagus and melted jack cheese, smothered with housemade mushroom madeira sauce and served on top of a bed of homestyle mashed potatoes. garlic aioli. Top with Monterey Jack cheese if desired. Penne pasta, red and green peppers, scallions, sliced chicken breast and tiger shrimp tossed in a Parmesan cream sauce with a smoky, earthy spice "bite".